Includes flows up to 18,000m3/hr. THE Goulds ITT GSC range is specifically designed for applications such as water supply primary lift and booster stations, power plant filtration, water treatment, and cleaning applications in the pulp and paper industry. 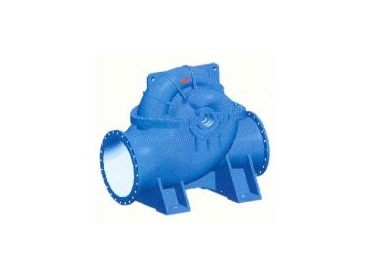 The building and fire industry uses this style of pump in many fire-fighting pump packages and for high flow cooling systems. * Discharge: Up to DN 1000mm. The pumps are constructed of cast iron and 316 stainless steel casings with cast iron, bronze, or 316 stainless steel impeller options. The impeller is the double-suction type offering low pulsation and is hydraulically balanced giving zero axial thrust within the pump. Other features include replaceable shaft sleeves to protect the more expensive shaft and replaceable impeller wear rings thus protecting the impeller from erosion. The seal chamber offers many seal options from packed gland, single and double type mechanical seals in various material options.